When you live in De Forest, having a functioning clean gutter system is a must. It will provide proper water runoff for your home or building, reduce or eliminate damage to your building and landscape as well as protect your roof. With large costs of fixing roofs, siding, landscape, structure and more, a gutter system is a smart and affordable necessity to long term home ownership. TIPLOK is a professional gutter repair and installation service company who services the areas of De Forest along with Dane County, Wisconsin. To schedule a gutter inspection of your home or for a new gutter system, contact us at 608-233-6936 or fill out our contact form. We will contact you to discuss your gutter service needs and offer a professional plan to protect your home or building with a proper gutter system along with maintenance services as well. 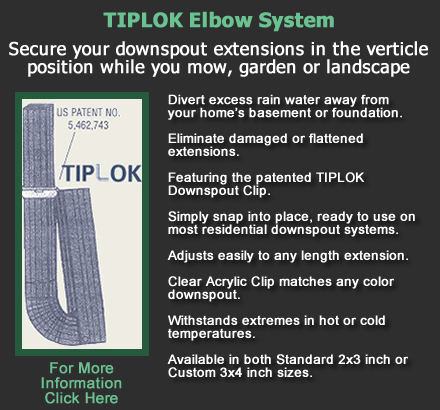 We at TIPLOK Home Services will also install our very own product, the TIPLOK Elbow System including the elbow clips. This system serves you just like any other gutter but with some extra features. It diverts harmful rainwater away from your home's foundation and also prevents damage to the foundation walls and dampness in basements. Whats special about this system is that you can now tip the gutter downspout extensions up, and out of the way, while you mow, garden, or landscape. This eliminates damaged or flattened gutter extensions and gives them a long life. We provide gutter services throughout Dane County including cities such as Cottage Grove, De Forest, Madison, Middleton, Oregon, Sun Prairie, Verona, Waunakee and Windsor.